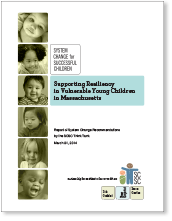 In 2013, the System Change for Successful Children project provided two separate 4-part training series on infant and early childhood mental health, one for early educators and one for child welfare staff (DCF in Massachusetts). Using a train-the-trainer model, each series offered materials, activities and strategies that a supervisor, administrator or outside trainer could use to train staff and/or colleagues. This 2013 train-the-trainer series for early childhood educators includes video of four 2-hour sessions (edited videos are shorter), each structured around an interactive PowerPoint presentation. Large and small group discussions, vignettes and case sharing, video clips and handouts supplement the PowerPoint for each session. The series was designed to be used by administrators or supervisors to train staff, but is also appropriate for self-guided learning. A parallel series was developed for child welfare professionals; and a separate final cross-training session provides a structure to bring early childhood and child welfare staff together to build relationships and increase mutual understanding, with a goal of improved collaboration between the child welfare and early childhood systems. Although the two training series are based on a train-the-trainer model, they are also appropriate for self-guided learning by individuals. The cross-training session can be offered as a stand-alone session, or to supplement earlier training sessions. Click the following links to view videos and resources for each series. A summary of the series content is provided below.